A late summer walk in Kenneth Hahn Park can be a bit dismal. Located in the Baldwin Hills of Los Angeles, this patch of nature shows the strain of the dry season. Whole hillsides are brown, crisp and dry. The invasive grasses and weeds that dominate are dead, tangled skeletons. The colorful explosion of wildflowers are gone. Many plants have entered a state of dormancy, their leaves either shed or left hanging withered and brown. Its winter in Southern California. Granted, last week it was a 100 degrees by the coast. Yet, just as the maples and birches of Vermont drop their leaves and go dormant at the arrival of snow, many of the plants of California do the same to survive the heat and lack of moisture of late summer and early autumn. Other plants hunker down, using deep roots to find moisture and stiff waxy leaves to conserve it, patiently waiting for cooler weather and rain to start growing again. The dirt and dust of the city covers the leaves, muting whatever green there is. A walk during this California ‘winter’ requires a more discerning eye, an attention to details. Little surprises abound. In spring, many of the hillsides in Kenneth Hahn Park are cast in a delicate shade of chartreuse as a sea of wild mustard bloom. The mustard is an invasive plants that appears and spreads wherever undeveloped land has been disturbed by the activities of people. Where dense stands of native plants remain, as in Griffith Park, the mustard is limited to the side of trails and roads. But in Kenneth Hahn, the native habitat is heavily fragmented with some hillside barren of any native plants. Here the mustard dominates, its thick growth preventing native plants from getting established. But sometimes through luck, intervention by people, or sheer determination, a native plant gets a foothold. This green patch of California sagebrush (Artemisia californica), has taken a foothold near a hilltop that was cleared of invasive brush several years back. California sagebrush is consider an pioneer species, one of the first to come back when habitat has been disturbed. As a perennial plant, once established, the sagebrush gains an advantage over the invasive mustard. Slowly it can grow and spread, perhaps to make it possible for another natives to get establish. 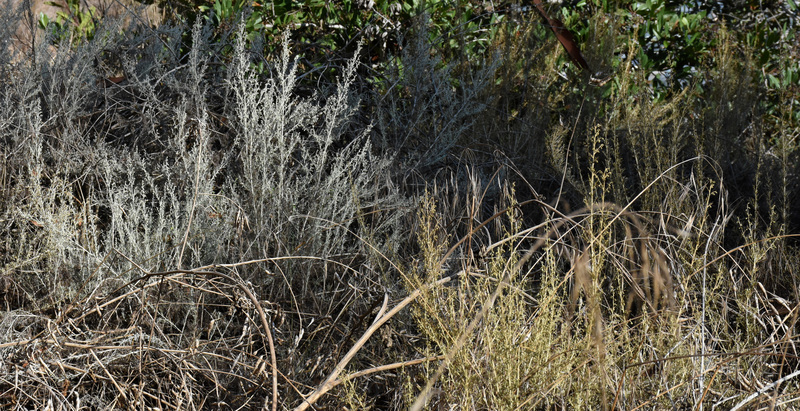 California sagebrush, a foundation plant for coastal sage scrub community, has adapted well to the dry summers. The appearance of plants can vary as the heat rises. In spring, the branches of sagebrush appear light green and feathery with long wispy leaves. As summer temperatures rise, the long leaves fall off replace with short tiny leaves. Some plants remain green, some turn a yellowish green, others become a silvery white. Plants that are unable to pull any moisture from the soil become completely dormant, appearing dead only to be resurrected with the rains. Look closely. The branches are covered with tiny flower buds getting ready to bloom. Dependent upon the wind for pollination, the flowers are small and inconspicuous, not needing to attract bees and birds to pollinate. Green, white or dead, be sure to run your hands through its branches and smell its rich aroma, another little detail. Western elderberry trees (Sambucus mexicana) are winter deciduous. With ample water it will stay green through the summer, but on dry hillsides they will lose their leaves early in the hot days of August. A dense tangle of branches and twigs are revealed, occasionally a small clump of leaves at the end of a twig or two. Perhaps because a deep root has tapped some underground moisture or maybe because of a genetic quirk in its DNA, a few nonconforming elderberry trees continue producing flowers and berries deep into the summer. Look long enough and other plant species can be found, growing out of sync with their brothers and sisters. In these oddballs may lay a key to the species’ survival, a little mutation that might keep new generations going on when the environment and climate change. Grown in a good locale, California sycamores (Platanus racemosa), will stay green all summer. These beautiful big trees can be found growing in ravines and by seasonal creekbeds in nature, offering shade and shelter. They are also often used to lined city streets. But surrounded by concrete and with only four square feet of exposed soil to grow in, by summer they can look ragged with scatter, wilted leaves unless it gets regularly irrigated or its roots manages to pry into underground water pipes and sewers. Other trees stay green no matter how hot and dry it gets. On the northern slopes of Kenneth Hahn Park is a mixed evergreen forest of non-native cypresses, pines and spruces blended with native Nuttall’s scrub oaks (Quercus dumosa), and toyons (Heteromeles arbutifolia). The past drought and the dry summers left the cypress and spruces with many dead branches but the oaks and toyon thrive in this environment. While the flush of wildflowers that appeared this Spring is gone, flowers are still be found throughout the park. California buckwheat (Eriogonum fasciculatum), is covered in white pom-poms of flowers. As the flowers die, they remain on the plant drying to a chocolate brown. In the same family of plants as the dandelions that seek to take over our lawns, Malacothrix saxatilis starts blooming in late spring and continues through the summer. Also known as a short leaved cliff aster, this is a scraggly plant at best. By the end of summer most of the plants are leafless now, but still support a large number of blooms. California aster (Lessingia filaginifolia), is another native flower. Not common in the park, this plant doesn’t start blooming till late summer. I almost overlooked this one, a weedy looking stick but it’s purple flowers caught my eye. In the garden, with a little extra summer water, California aster stays full and green, its flowers providing color well into the Fall. Several Spring blooming plants continue flowering through the summer, though in smaller numbers. California sunflowers (Encelia californica), can still be found sporting a few yellow flowers. Along another trail section, a California morning glory (Calystegia macrostegia), was found being inspected by an ant. One flower that was unexpected was an arroyo lupine (Lupinus succulentus). One of the first flower to appear following the start of the rainy season, by Spring they’ve all gone to seed and died. To see one blooming in early September is a treat. But the really treat are the gorgeous blooms on the sacred datura (Datura wrightii). When I first encountered one of these plants on a hike, I was sure it was a non-native plant. Nothing about it fitted the plant profile of a Southern California plant – a patch of lush green leaves appearing in the heat of summer covered with large white flowers that seem more appropriate in Hawaii. Yet, here it is. Also known as Jimson weed, the plant is poisonous if consumed but was used by Native Americans for religious ceremonies. Smelling it before even being able to see it, a recent burn site can be found along a trail near La Brea Boulevard. Luckily the fire was put out quickly and not too much brush was burnt. But several toyon and lemonade berry bushes weren’t so lucky. Yet they may not be dead. Both plants have a burl just below ground where the truck and roots meet. When the plants are burnt or cut down, new growth will come forth from the burl unless the fire was so hot as to kill it. It will be interesting to keep an eye on this burnt patch and see how it recovers. Among the brown grasses and bare branches, little bits of green appear where a young plant or seedling miraculously has survived. Most plants produce hundreds, if not thousands, of seeds just so one or two seedlings can take. And most of those seedlings will struggle to survive the next year. The young coast live oak (Quercus agrifolia), above is probably a few years old. On a hillside often dominated by invasive mustard, wild radish, and grasses an long leaf bush lupine (Lupinus longifolius), takes root, surviving not only the summer heat but also the competition from the invasives for light, water, and nutrients. My favorite was a little seedling growing in an exposed patch of dirt. A California sagebrush (Artemisia californica), looking more lush than most of its larger brothers. Some how its seed landed in the right spot and its root was able to dig in deep. The hot drying Santa Ana winds of September and October are still to come so this seedling may still not make it, but I’m keeping my fingers cross. Not all plants are dormant. They can be found getting ready for the next stage of their life cycle. Above, the green berries of toyon (Heteromeles arbutifolia), are ripening, to become festive red bunches with the arrival of winter and the holidays. Other plants already had their fruit ripen and are now getting ready to start over again. Flower buds start appearing on the above lemonade bush (Rhus integrifolia), and laurel sumac (Malosma laurina), below, to bloom in winter. Signs of animal life can also be found. Along the trail the leaves of the Western redbud (Cercis occidentalis), appeared to have been attacked by a madman with a hole punch. Similar holes can also appeared on the leaves of rose bushes. This is the work of leafcutter bees (Megachile species). These bees, among the 1600 native bees founded in California, appear similar to honeybees, a non-native, except instead of yellow-black strips, it is striped in metallic grey-black. The round leaf chuck it extracts is used to nourish its young. After boring a hole in old wood, it lays a egg and plugs the hole with the leaf which the hatchling will eat. Like honeybees, native bees serve a vital role in pollinating flowers. Yet most native bees live solitary lives and rarely sting since they have no hive to defend. Signs of animal life can be found everywhere that we often walk past without appreciating. Whether the work of leaf-cutter bees or of a patient rock stacker (Homo sapient), the story of the Park are found in the little details. A common inhabitant of the park is the red-tailed hawk (Buteo jamaicensis). The park is full of gophers, rabbits, and squirrels that forms its diet. The hawk flying in these photos is a juvenile, its tail not yet red. Red-tailed hawks can grow up to 19 inches long with a wing span around 4 feet. While the red-tailed hawk is a regular site in the park, at times an avian visitor makes a surprise appearance. By the fishing ponds near the park entrance, geese and ducks can be found – some wild, others domesticated. But one morning as I approached I got glimpse of large dark wings lifting off. Heading in the direction of the wings towards one of the higher ponds stood a bird nearly four feet tall. A great blue heron (Ardea herodias). It too was a juvenile, its coloring grey, not blue. With most of the wetlands that once dotted the Los Angeles basin filled in and paved over, artificial lakes and ponds in our city parks can play a vital role for the water birds that live or migrate through the area. According to scientists, birds are actually the descendants of dinosaurs. It’s hard to see the ancestry looking at a robin or sparrow, but with its tall frame, long neck and legs, and intense yellow eyes it’s not hard to imagine that a bit of velociraptor blood flows in the heron’s veins. A very common creature of the park are lizards – mostly western fence lizards (Sceloporus occidentalis) and western whiptails (Cnemidophorus tigris). In late summer, along the trails, dashing out of the way of falling footsteps, are baby lizards, not even two inches long. You need a quick, sharp eye to see them, like the one above. A favorite stop when walking up in Kenneth Hahn is the pond in Japanese garden. While not supporting a lot of native plants and animals, it is a wonderful contrast to the dry brush. Starting in late Spring and going through the summer water lillies blossom as their Lilly pads provide shade for koi. But their beauty is overshadow by the gorgeous water lotus flowers raising above the water. This little oasis is an invitation to slow down and linger. And be sure to stop and pay tribute to the king watching over his domain. With the other non-native inhabitants of the pond, the pond slider turtles (Pseudemys scripta), form their own little eco-system within the park. Kenneth Hahn’s trails and paths are a valuable resource for the City of Angeles. Hiking and jogging are great means of getting exercise. But don’t go so fast or get too focus on steps walked to miss the world around you. For here in the city is a different world where even in the driest months, life goes on, often right in front of our eyes. Surrounded by miles of concrete and buildings, this patch of nature is thriving. Slowing down and immersing ourselves in it we can become a part of it, and, perhaps, be inspired to see how we can bring a bit of it into our own yards. Couldn’t find our baby lizard? Here he, or she, is. My best guess is it’s a western whiptail, but I’m not betting any money on it! Great job Alan. Your pictures really enhance the story. I enjoyed following along. I walk through Hahn occasionally – so I’ll keep an eye out for the cast of characters you mention. I seriously did not remember that elderberry grew there. Perhaps I was just not looking for it. The Quercus dumosa was also a surprise, although I would not recognize it if I saw it anyway. They can be so variable. It seems most of the time the elderberry is leafless so I really wasn’t aware of how common they are in the park until after last winter’s rains when they flowered heavily followed by bunches of berries. The Quercus dumosa I see a lot on the north side of the park, but I used a couple of plant databases for the park to confirm it. Thanks for the comment.